I have been looking for a game to replace or better Avalon Hills 'War and Peace'. I believe I might have found it. This game has incredible detail, and seems so far to play out historically. By that I mean that it wouldn't play the same if you were using tank units or foot soldiers. The first thing you should know about this game is the packaging. You get a rolled up map in a circular tube. Then you get the counters in a small plastic wrapped bag. The next thing you receive is a small plastic case that you would usually keep washers or small screws in. So after separating the counters it has its own little case for them. What you do not get is the rules or scenarios. These are downloaded from the company's website. This is also nice, and is something a lot of companies are doing now so you can peruse the rules and scenarios before you buy the game. We will look at the actual physical pieces you get now. The counters are 5/8 of an inch square. 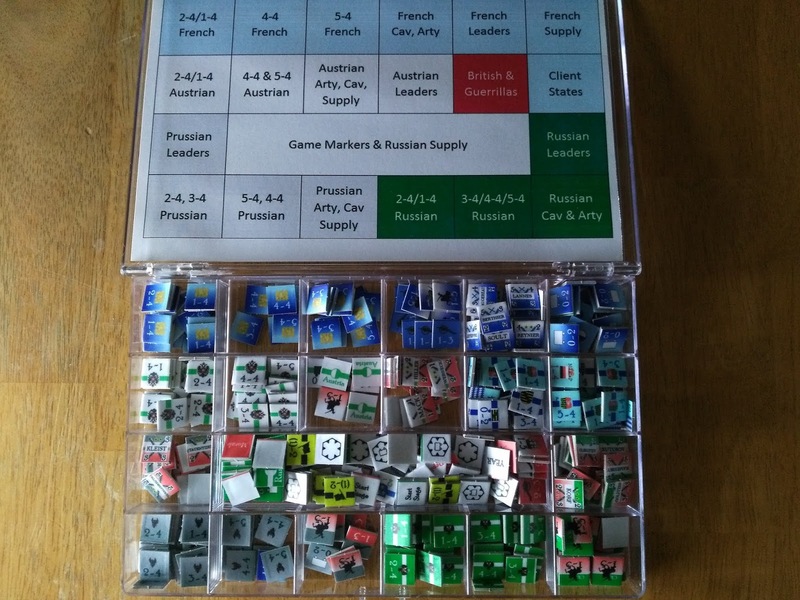 They are mostly your typical strategic game counters with just strength and their movement factor listed. The counters are physically different than any I have ever seen. They seem to have some plastic or something added to them to make them almost pliable. It also seems to make them more durable than the usual cardboard ones. The map is also different than normal. It almost feels and rolls up like it is made of leather. I assume it has gotten the same treatment as the counters. Whatever it is, I love it. When you spread it out it flattens immediately so there are no folds etc. It almost seems like you are unfolding a map from the period. I have not tested it, nor will I, but I believe the map would survive a drink being poured across it. As far as looks, the map is a standard hex map of Europe. This map goes from the French Atlantic coast to the border of Russia, and from the top of Italy to Denmark. The map's size is 23" x 30". The colors of the map are so much more vibrant than any other I have seen. There are maps just as beautiful out there, but none that pop out at you like this one. I assume this also has to do with the manufacturing process. The rules are long at seventy-nine pages. This might make some people pause. However I believe most of us have tablets or phones that it can be downloaded to. As mentioned, you do not get the rules or scenario booklet with the game. If this was to save money to make the counters and map better, then it worked. Forts are also in the game, but they are shown on the map. The games turn mechanics are a bit different from the norm. There are six two month strategic turns (Jan-Feb). 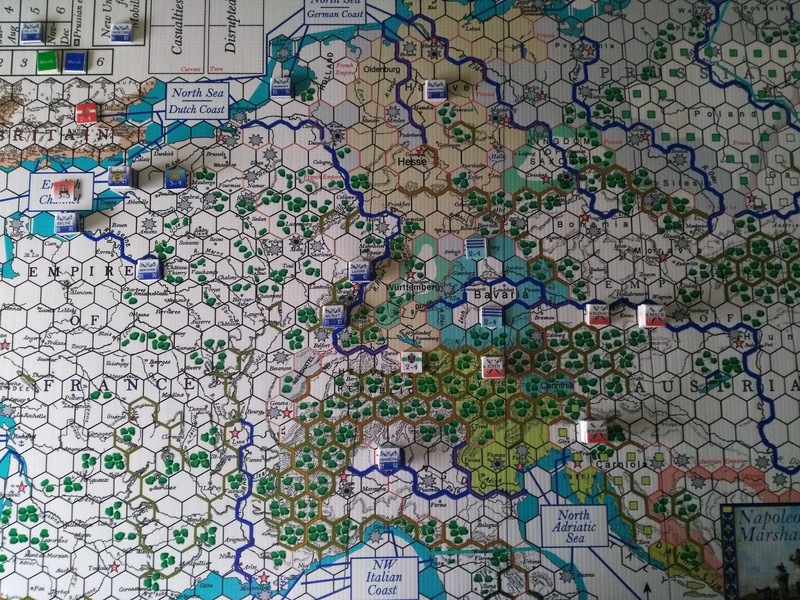 Within the six strategic turns are six operational turns for each strategic one. This is not just an operational game, but a strategic one. So in effect you are running your entire country or countries' war and peace efforts (in the campaign game). As a king or emperor you have to decide your country's production, replacements, and policy, and also mobilization and demobilization. Each strategic turn, the phasing player may purchase 'Command Points' which are used to activate leaders, units, or other actions. Movement and combat take place during the operational turns. Supply and lines of communication are important in the game. As a matter of fact, they take up four pages of the rule book. Lack of supply and attrition can kill your armies much quicker than losing battles. Leaders and their various abilities, and the rules of what they can do is another important part of the game and rule-book. Leaders affect activation, movement, combat, reinforcement, and also have special abilities. Napoleon has the ability to 'split' the coalition armies that he is fighting into their separate national units. Wellington can remove disruption on British units that suffer it during battle. As I mentioned, the rules and scenarios are a download only, but that means anyone interested in looking at them can peruse them at their leisure.The rules for combat are unique and quite involved. There is a CRT, but there are no dice rolls. First the attacker figures out the defender's losses and then the defender checks on the attacker's losses. They both take place at the instance of combat. Meaning that the defender doesn't take casualties, and then checks on the attacker's losses after his losses are deducted. So if both the attackers have a combat number of twenty, twenty would be where on the CRT you would check for casualties to both (terrain etc. are also added in). The leader with a stack can 'protect' or absorb losses. So the higher the number of the leader the easier to absorb losses. In this, the French have an ace up their sleeve until the latter years of the Napoleonic conflict. I am making it seem more involved then it really is. I will include a link to both the scenario rules and the rule-book at the bottom. 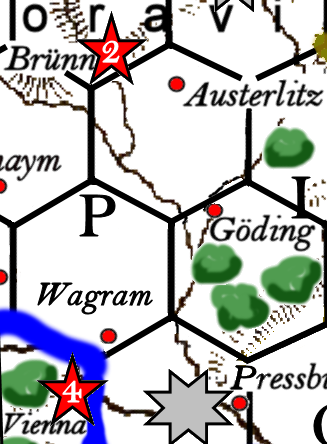 most of its production, or stay forward and risk losing most of its army? France must be prepared to take on three opponents at once (Russia, Austria and Prussia), plus a fourth one (Britain) that finances the others. Napoleon must nimbly defeat each one at a time, or risk facing them all together. Austria has completed Army Reform and increased the size of its army and is ready to take on Napoleon again, but without Prussia or Russia to help. 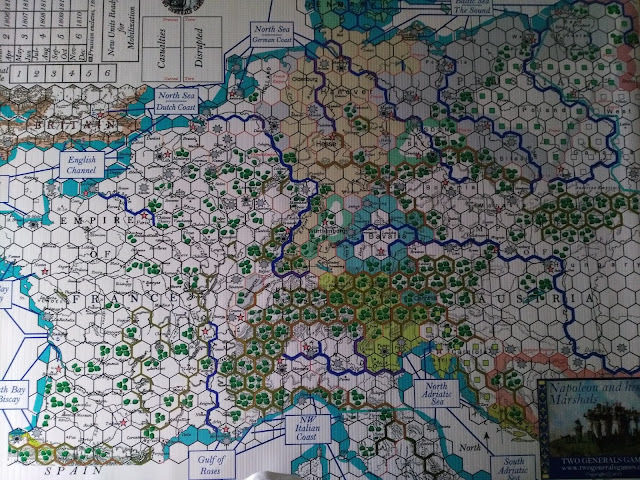 and expansion maps are optional) Napoleon must deal with the "Spanish ulcer" and a resurgent Austria at once. France is victorious everywhere but Spain, and that is encouraging Russia to resist once again. Can Napoleon defeat the Russians once and for all while handcuffed in Spain, or will he try to defeat Spain before Russia can liberate Germany and get Prussia and Austria as allies? Napoleon puts together his largest army ever to defeat his biggest continental rival. But can LaGrande Armee repeat its successes in such a large nation against a foe that is prepared to fight it? Following the loss of most of his army, Napoleon must scramble to retain his client states, and rebuild his army. Can he hold the now united Coalition off long enough to achieve the impossible yet again? Can Napoleon retake France and return it to glory? Or will he face another Waterloo? 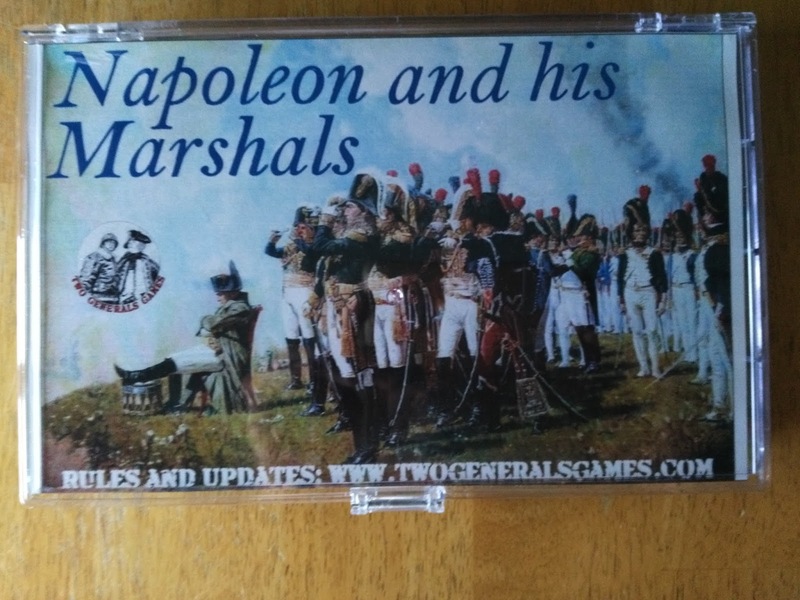 1807/1809-1814 Peninsular War Scenarios (requires basic set plus Peninsular War set) A long scenario, starting in either 1807 or 1809, with a small number of units, the players will have to face the limitations of a small war in a poor nation with terrible terrain for campaigning and a long sea coast that favors Britain's best asset-the Royal Navy. for 130 hours or so. That's about 32 weeks if you play 4 hours once a week. Play tests averaged about 4 months. As you can tell, I am very impressed by the game's components. As far as the game play I am somewhat impressed. This might be because as a person who has rolled a die for most of the last fifty years on a CRT, new things are hard to learn. I have played other games that do not use die rolls for the CRT, but those have made the function of combat in these games relatively easy. Combat in this game was a bit hard to get a grasp on until I worked through a few examples for myself. The rule-book does have examples and I probably just needed hands on to get the gist of it. As I mentioned at the beginning, I was looking for a replacement for a tried and true friend. I am not sure I have met the replacement as added another good friend to my table. The game has so much more to offer (marching to the guns etc. ), than I can mention in this small space. Please take a look at the link below.